Mobile video ads on the messaging app reached over 70% of the total 13 to 34-year-old U.S. population on a monthly basis during the last quarter. Snapchat parent company Snap, Inc. reported total revenue for 2018 crossed the billion-dollar mark for the first time with $1.2 billion. The company saw 36 percent year-over-year growth during the fourth quarter of last year at $390 million, nearly a $100 million more than it earned during the third quarter of 2018. After quarters of declines, the company stabilized its user base at 186 DAUs in the last quarter of 2018, holding steady from the third quarter. Snapchat ads outlook. Snap reported its premium mobile video ads reach over 70 percent of the total 13- to 34-year-old U.S. population on a monthly basis during the last quarter of 2018. The platform’s Collection Ads product delivered twice the return on ad spend versus comparable Snap ad formats, and the Snap Pixel saw more than double the number of purchase events in the fourth quarter compared to the third quarter (600 million in Q4 up from 230 million in Q3). 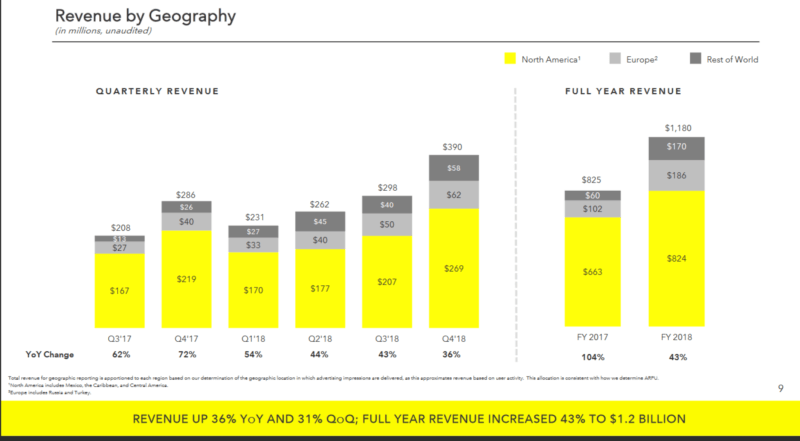 Snap reported that the improvements it has made to machine learning models for app installs and lower-funnel bidding events have resulted in higher “always-on” revenue. Snap also said its six-second non-skippable Commercial ads, which were introduced last April, continued to perform well. The company did not offer any specific data on the Commercial ad unit, but did say the majority were purchased via its Premium Content Targeting tool that is part of Snap’s self-serve ad platform for large brands and agencies. A look at Snap advertisers in 2018. MediaRadar, an ad sales intelligence platform that tracks Snap ads, said Snapchat had 1,400 advertisers in 2018, with most running one-off campaigns during a single quarter of the year. Only 17 percent of Snap advertisers ran campaigns for more than half of the year, per the analysis. According to MediaRadar’s report, media (30 percent), tech (13 percent) and retail (10 percent) advertisers accounted for more than half of the ad spend on the platform in 2018. MediaRadar says Snapchat saw the highest number of advertisers running ads during the third quarter of 2018. The top five biggest spenders on the platform for the year included Comcast, Mars, AT&T, Adidas and P&G. “Snapchat’s user numbers stabilized which contributed to better than expected revenue on the quarter. The good news is likely to drive even more interest from advertisers,” says MediaRadar CEO and co-founder Todd Krizelman. More on Snap’s DAUs. 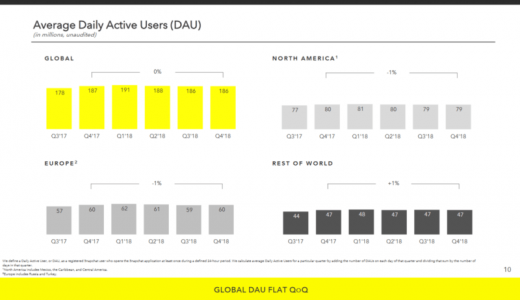 Snapchat’s user growth has been a problem for the previous two quarters, with DAUs dropping from 191 million to 188 million between the first and second quarters of 2018, and then from to 188 million to 186 million between the second and third quarters of last year. 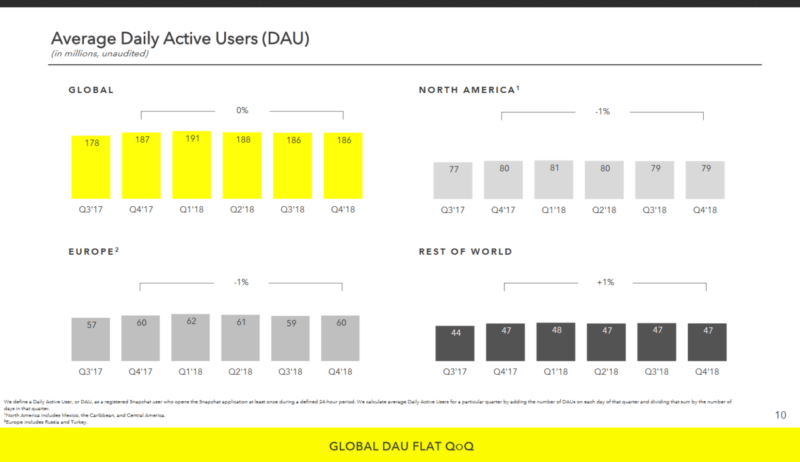 Finally able to stabilize DAUs in the fourth quarter, Snapchat focused on user engagement for its most recent earnings report. The company emphasized iOS DAUs did increase both quarter-over-quarter and year-over-year in Q4 2018. It also said it has begun to roll-out its new Android app. Why you should care. If Snapchat is able to address user growth concerns and show value to brands with new ad formats as further enticement, more marketers may give it a (second) chance — especially those aiming to connect with younger audiences.